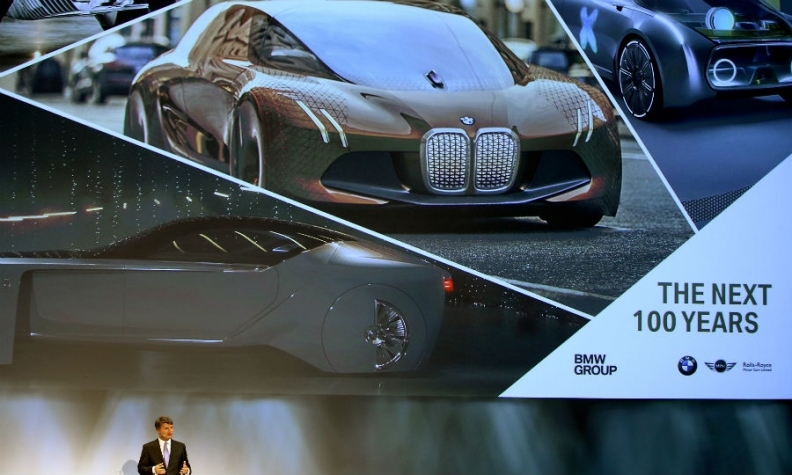 BMW's self-driving cars will retain steering wheels, CEO Harald Krueger says. He is pictured at the 2016 Handelsblatt auto summit. MUNICH – BMW will focus on leadership in electric drivetrains and connectivity rather than increasing vehicle sales, CEO Harald Krueger said. While the automaker aims to continue to boost unit sales, it has no fixed targets for 2020 or 2025, Krueger said. Last year, BMW built a record 2.37 million BMW, Mini and Rolls-Royce cars. Its sales of electrified vehicles, including plug-in hybrids, were 62,000 with sales of 25,500 for its full-electric i3. BMW aims to sell 100,000 electrified vehicles this year. Press reports suggest BMW plans to reach 3 million units by 2020, which would imply an average 6 percent annual growth on 2016 volume. Krueger said future success will depend on being a technology leader in new growth sectors such as electrification and connectivity rather than sales volume, although BMW is adding more production capacity throughout its global network. BMW also needs to be the most attractive employer "because you need the best people to lead in technology," Krueger told reporters at the company’s headquarters here Thursday. Battery powered cars are not the only solutions for zero or low emission vehicles in future, he said. Fuel cell vehicles also will be crucial. Fuel cell car sales are not moving particularly fast because they need even more infrastructure than electric cars but they will eventually, so BMW needs to be ready, Krueger said. A partnership with Toyota is helping BMW to advance the technology faster and to share the cost burden but it is not possible to predict how much sales of fuel cell cars will grow by 2030, he said. BMW also needs partnerships to develop cars with autonomous driving features so it is cooperating with suppliers, Krueger said. "We are not the best in making radars and vision controls, so we work with Mobileye. We do not make chips, so we cooperate with Intel. We have just taken on board Delphi to cooperate on software and system knowledge." However, suppliers will never offer a comprehensive autonomous driving solution because automakers will retain computing power and software as a core competence. For a self-driving car to have a BMW’s or Mini’s handling characteristics, or for a Rolls-Royce to feel like being on a “flying carpet,” you need an automaker’s expertise, Krueger said. "We are in the premium business. We sell design and emotion, not just a way of getting from point A to B." BMW will always offer a steering wheel, leaving to the driver the decision when he or she wants to drive. "You will never see a robo-taxi from BMW," Krueger said. BMW said on May 2 that it will start production of its iNext full-electric car with self-driving features in 2021 at its plant in Dingolfing, Germany. The iNext will be capable of Level 4 autonomous driving, classified by the Society of Automotive Engineers as "high automation" but offering the chance for a human driver to intervene. It is one step below Level 5 "full automation" in which no steering wheel is necessary because the vehicle can carry out all the tasks of a human driver. BMW this year will test on roads 40 cars with Level 3 or "conditional automation." Currently those cars require so much computing power that the trunk is full of computers. "This is not what a customer wants," Krueger said. Krueger said he hopes the UK and the European Union can reach a pragmatic compromise over trading conditions following Britain’s withdrawal from the bloc. "On the manufacturing side we are flexible. We build many Minis in the Netherlands but the UK is an important market for BMW and is Mini’s biggest global market." Krueger reiterated that EU targets to drastically reduce CO2 emissions by 2020-2021 cannot be achieved without diesel engines, which are 15 percent to 20 percent more efficient than gasoline engines in terms of CO2. "You need to invest in clean diesels and Euro 6 engines are clean diesels," he said. BMW forecasts that up to 25 percent of its vehicle sales may be electrified vehicles by 2025, in line with most predictions for industry volumes. Even if BMW reaches that figure, 75 percent of its sales will be cars with an internal combustion engine with a percentage of diesels in the mix, Krueger said. Electrified vehicles accounted for 25,000 units in the first quarter, or about 3 percent of BMW sales, from below 1 percent in the same period last year, Krueger said. He did not speculate what the percentage of diesel sales will be by then but said the day will eventually come when the costs of continually lowering diesel emissions will be too high. Currently BMW still has markets where its diesel share is increasing because it is the customer who decides. "If you drive 30,000 or 50,000 kilometers a year, a diesel still makes the difference in the cost of ownership," Krueger said.